A year ago, a neighbors car was broken into and everything was taken. Unfortunately it wasn’t a few items from the glove box, they’d taken a large amount of personal belongings. Then on NextDoor.com messages began popping up about garages being stolen from, then houses and soon more cars. In fact, just a couple days ago another house down the street was broken into. Yep, our nice quiet neighborhood had become a hot spot for theft. Before all this we were on the lookout for bears, mountain lions or new born fawns passing through our yards. Without a doubt, many households had conversations about what animals had or might have passed through their yard. 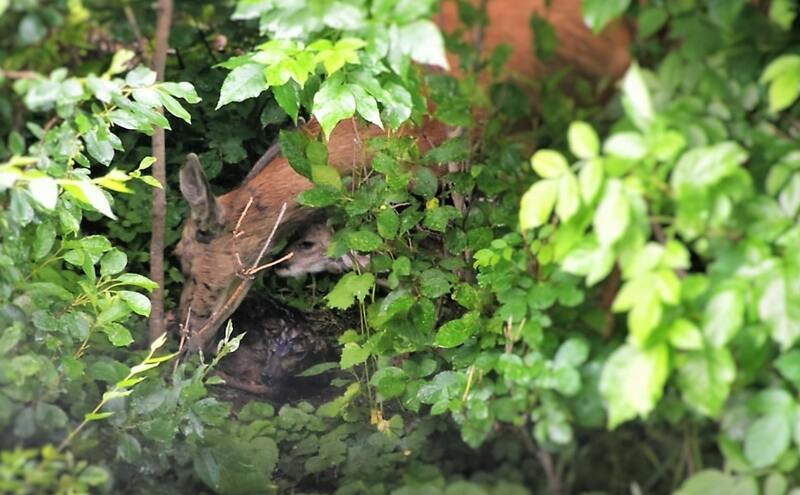 On multiple occasions we’ve had fawns born in the oak brush behind our house. Very exciting!! My backyard is actually a major thoroughfare for animals. I have toyed with the idea for years of installing a camera to see what actually passes by. Unfortunately those thoughts had left when our luck ran out. This last fall our cars had been rummaged through not once but twice. The first time was two cars; the second just one. The time to take action was here. I have surveillance cameras at my office which are pretty straight forward. Capturing video inside generally doesn’t have long distances or changes in lighting. Also what will or will not be in the frame is very predictable when working inside. We know where people will be and what exactly they will be doing. 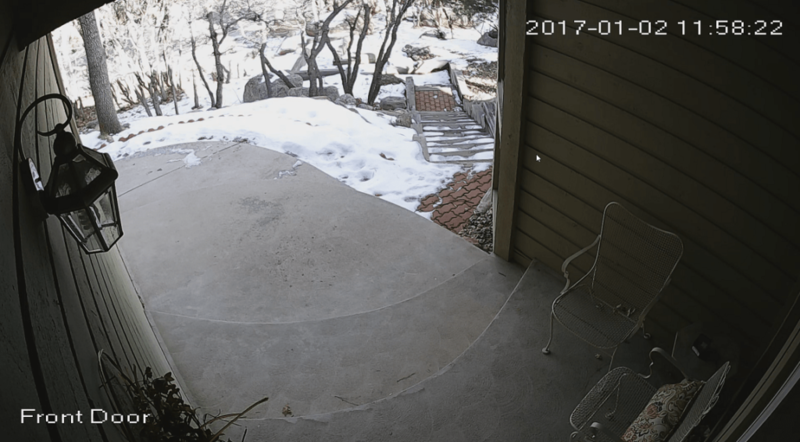 All this changes when working with outdoor cameras. Distances become much farther. For example, do you want to frame the porch, the porch and walkway or those and the street? Here the road in the background is hardly recognizable. In reality it’s not too bad but to get any great detail we’ll need higher resolution and possibly a higher bit rate. Then you have lighting. Maybe you’ll have a porch light, a thief’s flashlight, street lights and finally perhaps car lights. This is all important to consider because Infrared (IR) Lighting is only on when lighting is low. If a porch light is on, the IR lighting will turn off and your visible range will then be tens of feet. Lighting in the distance is hardly an issue, it’s the up close, near camera, lighting that can be difficult. My personal dilemma is motion activated floodlights, “do I want the light on or do I want the light off?” It’s a trade-off between having a deterrent versus video quality. Here the left images is no flood light and the right is with flood light. Logically thinking cameras should be out of reach to avoid tampering. However it’s also important to consider proper angles. A good angle can increase the chances of capturing facial images, vehicle descriptions and possibly license plates. I’ll be the first to tell you getting all three from the side of a house with a single mid-range camera is next to impossible. Images can be pretty grainy when trying see that sort of detail at a distance. Zoomed to 300% at roughly 75 feet, imagine trying to identify facial details or a license plate number. However surveillance cameras aren’t always used to detect theft but maybe also slip and fall accidents, traffic violations, vandalism or simply invasion of privacy. 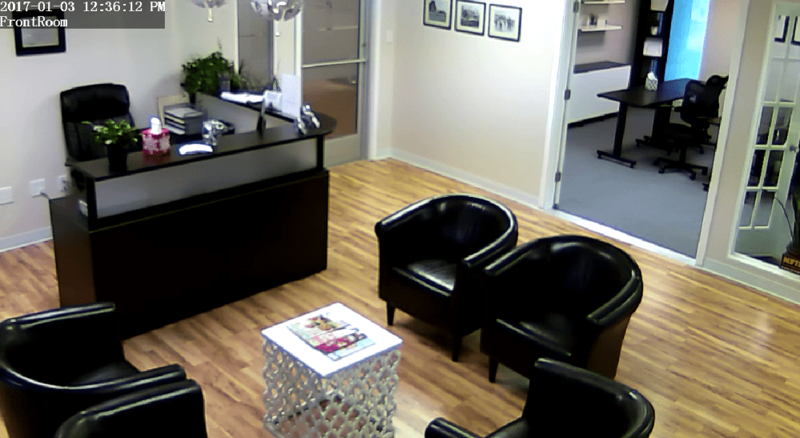 Considering all scenarios will help dictate security camera placement for your property. We can’t forget the legalities of where not to place security cameras. Even though we are talking about home surveillance it goes without saying states prohibit cameras in private places. Generally speaking cameras in public areas are acceptable; just about anything goes. Meaning streets and sidewalks are considered public. However if a camera is positioned towards a private area there may be privacy concerns. Even though a camera may be located outside it cannot be positioned in a manner that is intended to invade an area with reasonable expectation of privacy. Disclaimer: Legal description is not legal advice; you should consult your attorney before choosing the right placements for you. Lastly, you will need to run some sort of wire to any camera. It might be power, video transmission or both depending the type of camera you choose. Unfortunately placing a camera on a window ledge is not a viable option. The IR LED’s will pick up light reflection off the glass and dramatically reduce visibility. I’ve put a lot of thought into how to run a cable through the wall, through the ceiling, through the attic or through some conduit all just to get a network cable to the most desirable spot. If pulling a cable isn’t your forte, Electricians are really good and can run wires to some insane places. I could list a bunch of cameras based upon reviews, etc. But I really want to share the variations between cameras to help you decide what best fits your budget versus what is a suitable application. From the outside you can hardly tell the difference between a CCTV (Closed Circuit Television) Camera or an IP (Internet Protocol) Camera. Before choosing a camera it’s important to know a little something about each. Reviews will get you a long way but don’t actually tell us the difference between a CCTV camera and an IP Camera. Standard analog camera resolution is measured by the number of TV Lines (TVL). Most newer cameras range between 420 and 1920 TVL. From what I have read, 1000 or 1200 and better will offer the best quality. The thing about security cameras is the video must be recorded somewhere and the most common option for CCTV cameras is a DVR. The camera sends the signal through a coax cable or CAT-5 cable and when the signal is received by the DVR it’s then converted to digital and compressesed. The most popular DVR resolutions are CIF and D1. CIF uses a resolution of 320×240 pixels and D1 is 720×480 pixels. D1 is 4 times the size of CIF and is therefore compressed less. The more the compression the more the quality is lost. See the Camera Resolutions table below for an overall comparison of video resolution and quality. The takeaway here is it doesn’t matter if you have the best camera on the market, if a DVR records at a low resolution you’ll never see the potential of your cameras. It is also important to know power is delivered as either a paired cable with the coax, through the CAT-5 or as a separate power cable. It really depends upon the manufacture and the camera you buy. There are multiple formats for CCTV cameras. The table below covers many of the formats but in general most readily available cameras appear to be HD-CVI format and can be bought in kits or pieced together quite nicely as long as you match the camera TVL and format to the DVR specifications. Also, CCTV cameras are little more plug-n-play. You connect the cameras, setup each camera for motion detection, record times, etc., connect the DVR to the internet, configure your cell phone or mobile device and you done. Might sound like a lot but compared to IP Cameras it’s a snap. Check out a YouTube video of an image quality comparison by Clinton Electronics. ** Table based on Super Circuits format chart. Then there’s digital cameras whose resolution is measured by megapixels (MP). In today’s market you’ll find cameras ranging from 1 MP to 10+ MP. Of course the higher the resolution the higher the video quality and details become more visible. Where IP Cameras differ from CCTV cameras is the dependency on a DVR, or in the IP Camera world an NVR to record and store video. IP cameras provide an interface at the camera level, at the NVR level or at the Cloud level. At the most basic installation you can buy a single camera and use it to monitor live video, record video directly on a Micro SD card on the camera or stream video to the cloud (for a fee) and save or monitor it there. How it works, you connect the camera to your network, access it via a webpage to configure motion detection, alerts and storage location. Once its configured you’ll be able to connect your phone and view it live from wherever you are. A single surveillance camera setup is quite easy actually. Even two surveillance cameras is pretty easy except now you are dealing with two separate cameras. To bring them all together you need a cloud solution or a NVR. Power is very similar to that of the CCTV camera. Power is either delivered through the CAT-5 cable using a Power Over Ethernet (PoE) injector or as a separate power cable. This is determine by the camera you buy. If you buy a WiFi camera, the power will be through a power cable you plug into the wall. Otherwise you’ll have the PoE option if its a network connected camera. The last consideration with an IP camera is the exposure of your computer network. If a WiFi camera is used, it is more secure than a direct connected camera. In order to access your WiFi nothing has changed and everyone is still required to know the passcode. Keep in mind though, if you have an unreliable WiFi or it’s far away, you may experience camera connectivity issues. However, if a camera is direct connected, in theory, a person could disconnect the camera and have access to your network by plugging into the network. Then again, you gain considerable reliability over a WiFi network. I’m not sure someone would go to the extent of removing a camera and connecting to a home network but definitely something to be aware of. One solution to protect your network is to have two routers daisy chained one after another behind your internet modem. The cameras would be behind router 1 and everything else behind router 2. If you already have complex firewall settings this could make it even more complex. When considering an indoor versus and outdoor security camera there are four points to consider. Features, low light sensitivity, weather resistance and finally durability. First and foremost the features are generally the same with a few exceptions. Pan, Tilt and Zoom (PTZ) functionality is more difficult to find and at a reasonable price for outdoor cameras. Also, audio and voice functionality is hard to find. The reason why both are hard to find is pretty straight forward and that’s making a camera weather resistant. I’ll share more about that in a moment. 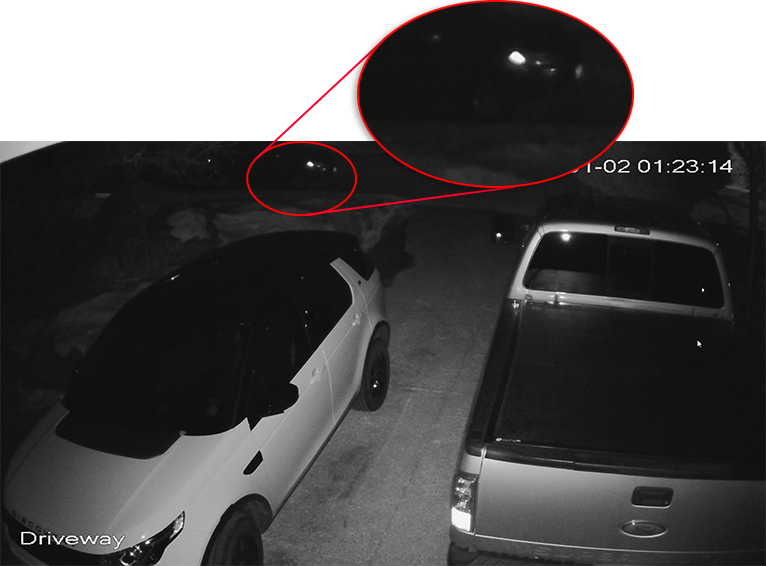 Second is low light sensitivity and exterior cameras are designed to work with greater distances such as allies, walkways or driveways. Unlike rooms or at best hallways. Night vision cameras surround the camera lenses with IR LED’s. Everything on earth outputs a certain amount of heat and the LED’s captures this information to generate a black and white image. Naturally the more LED’s a camera has the more heat information it can capture ultimately offering greater distances. Unlike indoor cameras, outdoor cameras will have more LED’s which provides greater viewing distances in low or no light situations. Next, many outdoor devices, including cameras, comply with International Electrotechnical Commission (IEC) Ingress Protection (IP) rating. When looking at outdoor cameras you might come across ‘IP67 Weatherproof’ in the description. In short this means the camera complies with an IP rating where the next digit indicates resistance to solids and the second digit indicates resistance to liquids. If an ‘X’ is in either position that means it has not been tested for the corresponding solid or liquid digit. In most cases you’ll see 67 where 6 means protection from harmful dust and 7 means protection from water up to 1 meter for no more than 30 minutes. Hopefully this is a big flag as to why no audio or PTZ. Lastly, outdoor cameras are considerably more durable since not only do they have to be more resilient to the elements but to potential tampering. Usually outdoor cameras are made of a sturdy metal and indoor cameras of plastic. Generally most retail cameras offer integrated storage. Usually in the form of a Micro-SD card and with potential size limitations. In many cases cameras are limited to a fixed size of integrated storage. Also, the amount is usually only enough to store hours or at best several days depending on the camera resolution. This might work okay for inside cameras but I would discourage using this type of storage for outdoor cameras. In my opinion, what’s to stop someone from removing the storage other than not knowing if the camera is or is not using the integrated camera storage. There are a lot of reasons to not use integrated camera storage but it’s good to know many cameras provide a means to connect and view remotely. Keep in mind this usually means each camera must be set up and viewed individually. So if it’s a complicated process by making firewall changes this might be less than desirable. Cloud storage is what everyone seems to gravitate towards and rightfully so. Everyone wants to protect video recordings especially the one where the recording device itself is stolen. Unfortunately, cloud storage is not cheap. There is technically two parts to cloud storage for video surveillance. The more obvious is video storage but we need to remember image storage. There are ways to mix these two to work for your setup. When an alarm or motion detection occurs, most retail surveillance cameras support remote FTP storage and email. Bad for us, FTP is not very common for the average person. However if you do have access to it you can save video and/or snapshots to FTP. Alternatively, an email can be sent with a series of snapshots. Personally I don’t like emails since they can quickly fill up email storage or bombard you with activity outside the normal schedule. As a result, you might become numb or complacent to what should be attention grabbing. I’d REALLY like to see Google Drive, OneDrive or Dropbox as upload options but FTP seems to be the norm. Nevertheless, FTP is a great alternative. It’s a little more management on our end but definitely satisfies the off-site concern. One added benefit to cloud storage is centralized storage and camera access. Unlike using integrated camera storage where each camera functions independently, using a cloud application brings all the features and functions to one interface. Accessing might be an application on your computer you install that talks to the cloud server. But will more than likely be a website you access from your computer and an application you install on your phone or tablet. Unfortunately, none of this is free and will cost you monthly or perhaps annually depending on the plan you choose. Many cloud services are month-to-month while others are not. It’s also important to know the cost is usually dictated by the number of cameras. So if you have more than a couple cameras this can get expensive pretty fast. Fortunate these are probably the easiest to configure. CCTV cameras use an Digital Video Recorder (DVR) and the IP cameras use a Network Video Recorder (NVR). A DVR takes an analog video input with a BNC connector and the NVR takes a digital network video input through the network. DVR’s are pretty straight forward, you plug in the cameras. NVR’s are almost as easy except each camera should be configured with a static IP address but this is not necessary. If you chose based strictly on quality, the NVR can record much higher video quality due to it’s ability to record in Megapixels. The limiting factors would the be speed of the network, the processing power and the amount of disk space. On both, once the cameras are connected each can be configured for motion detection, motion detection regions, email notifications, remote storage and much more. Connect each to the internet and generally each manufacture gives options for viewing the cameras remotely using your cell phone or network computer. DVR’s and NVR’s have a huge advantage over any other storage option and that’s when the internet is down your system continues to run and record as normal. Cloud storage sounds great but when the WiFi stops working or the internet is nowhere to be found the entire system is down. I have all my hardware on a batter backup. If I lose power I still have hours of power to keep my surveillance system fully functional. A LOT!! This is actually a little complicated and probably deserves it’s own post. But, let me break it out with something simple. There is no real set rule of thumb since cameras are continuously evolving and can adjust video quality based upon it’s application. But to really capitalize what new cameras offer I’d suggest a minimum of 1 TB per recording camera. With 3 or 4 MP cameras this will give you roughly three or four weeks of recordings. In time it might be 2 TB per recording camera as 4, 5 and 6 MP cameras become more prevalent. Finally, if you use on-premise storage like a DVR or NVR consider putting it in a Lockbox. If you decided to build your own, make sure it has good ventilation or a fan. You may also think about posting surveillance signs to help inform guests and also as a deterrent (Amazon.com). Remember, the intent is prevention first record second.